My first antenna launcher was made with a $5 slingshot and a $2 fishing reel I got at a yard sale. In the March 2009 QST magazine Byron Black W4SSY had an article for a Spudgun antenna launcher. After reading the article I decided to build one. The two Air guns in the right photo I made from the plans of W4SSY. The top one uses an electric trigger tripped with two 9V batteries in the box. The bottom one uses a Manual trigger made from an air duster. Folding the barrel back over the air cylinder shortened the air gun to 28”. With 25 PSI it will shoot the projectile well over my 60 foot pine trees. 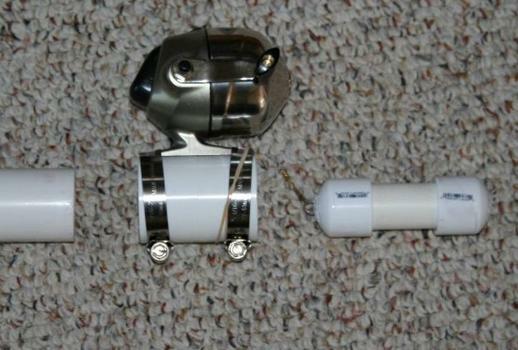 I mounted the fishing reel on a 1 ¼ inch coupler that slips over the end of the barrel for launching then slips off for easy reeling. 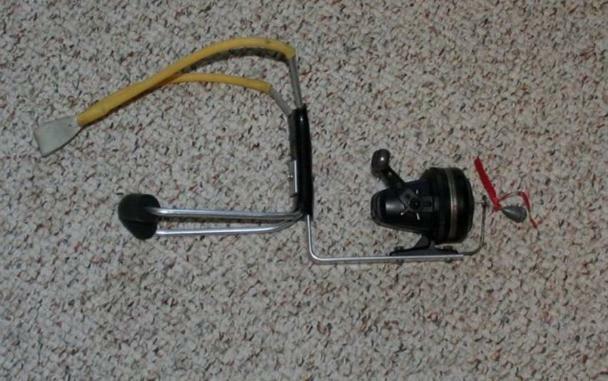 The photo on the right is my backup launcher and spare reel. Two photos of the antenna launcher made by Steve ND9O.